We’re not short of novels that strive to answer the impossible questions about life, friendship and loyalty, but there’s always room in our libraries for a story as emotionally honest and heartfelt as Dan Gemeinhart’s The Honest Truth. And while it certainly targets a younger audience, older readers will be equally moved by young Mark’s perilous journey to the top of a mountain; an objective laced with far more importance than a mere physical feat. The Honest Truth is told in alternating first-person voices, and deals with a twelve-year-old boy’s decision to run away from home to fulfil his dream of climbing Mount Rainier. It’s something Mark has always wanted to do – and with the re-emergence of his cancer, he’s decided not to waste any more time. It’s now or never, and Mark is determined to seize his final days, regardless of the hurt his departure will cause his parents and closest friend, Jess. With his uber-affectionate and loyal dog, Beau, Mark makes his escape, armed with scrounged dollars, insufficient food supplies, old-school camera, and a notepad filled with Haiku – which play an important part of the story, and indeed feature throughout various chapters. Though Mark planned for a treacherous journey – one filled with pitfalls, both seen and unseen – it is a far more testing expedition than he anticipated – but one he is determined to see through to the very end. Along his way, Mark is helped and hindered by various characters, but it’s his dog that deserves the spotlight. His unwillingness to leave his master, his unabashed loyalty, is detailed numerous times – and even when it’s contrived, it’s still undeniably moving. Dog lovers will be nodding sagely, expecting their dogs to follow Beau’s example. The alternating chapters feature Mark’s best friend, Jess – who knows where Mark is headed, and must wrestle with the implications of her decision to inform, or not inform, the authorities about Mark’s destination. Hers is a morally complex story, and it’s during these chapters readers will question the validity of Mark’s journey: he made a decision that has resulted in the heartbreak of those closest to him. Do his reasons justify such hurt? Is there actually a right answer? There is plenty for readers to ponder: what would a true friend do? Abide by her friend’s wishes and keep his secret? Or break a promise to save his life? Veteran readers might anticipate its conclusion, but the journey is still worthwhile. 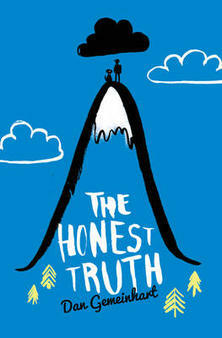 The Honest Truth is a riveting, emotionally powerful read.